1. Pull your hair back well with with head band and remove any makeup (or not, but definitely remove eye makeup with this natural make-up remover). 2. Take about a teaspoon of raw honey from the jar using a spoon or the tips of your fingers. 3. Rub your fingertips together a bit, then smear the honey on your face evenly. I find it helps to dot it on first, then smear gently. 5. Rinse off with warm water, then pat your face dry. You’ll be surprised at how easily it comes off! I often follow my honey mask with an apple cider vinegar toner, then moisturize with coconut oil. Don’t worry–the wonderful fragrances from the honey and coconut oil override the potency of the vinegar. 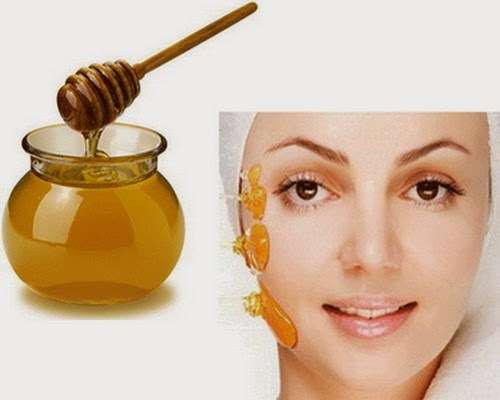 You can moisten your face with a small bit of water before applying the honey. This makes it way easier to spread, but you don’t want to water down the honey. Try splashing some water on your face, then patting it almost dry with a towel. Do this every. single. day for at least 2 weeks to get started. Twice a day is ideal, but once a day is alright, too. After a while you can reduce the frequency of honey masks and just use coconut oil. Choose a raw, unpasteurized honey to make sure all the enzymes and nutrients are in tact. Who’s willing to try putting food on your face? If you deal with any kind of skin problem, honey can be incredibly beneficial. And you can’t get much easier (and truly cost effective) than one simple ingredient for a homemade beauty product. As a side note, I’ve also learned that mead (fermented honey wine) is incredible! If anyone has had experience making their own mead, please let me know. I want to learn!